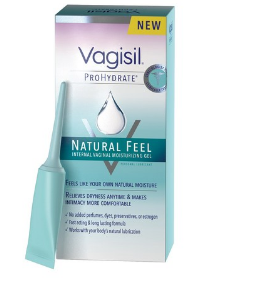 Just in time for Valentine's Day, Vagisil announced the launch of Vagisil Prohydrate® Natural Feel, an internal personal lubricant and moisturizing gel designed to relieve vaginal dryness and make intimacy more comfortable. The doctors and intimate skincare experts at Vagisil, who are all women themselves, were determined to develop a breakthrough solution that would not only treat dryness in an effective way, but also reflect their research that current lubricants weren't meeting women's personal preferences such as being too messy. The team conducted more than 20 research studies and surveyed more than 7,000 women to understand what they wanted in a dryness solution. Women of all ages experience vaginal dryness. Vaginal dryness can be triggered by stress, certain medications, breastfeeding, menopause, among many other life factors. The condition affects many younger women long before they hit menopause. 60 percent of dryness sufferers reported that they've experienced symptoms of vaginal dryness before the age of 40 and more than 76 percent of these women experiencing vaginal dryness during sexual activity. Vagisil's Prohydrate® Natural Feel Moisturizing Gel is designed to feel like the natural moisture that a woman's body produces and has no added dyes, preservatives, perfumes or estrogen. The unique bio-adherent formula coats the vaginal wall to provide dryness relief instantly, so there is no waiting to be intimate, then it slowly releases moisture over time for a long-lasting benefit. It features the unique properties of Hyaluronic Acid, a naturally occurring component in the skin proven to attract and retain moisture. Hyaluronic Acid is found throughout the body and is present in almost every cell. The product works with a woman's body to supplement her own natural lubrication. Each box of Vagisil Prohydrate® Natural Feel Moisturizing Gel comes with eight easy-to-use, single-use pre-filled applicators that insert effortlessly and targets the source of dryness. The product is long-lasting and may be used in advance of intimacy (so only the user knows they are using it) and is compatible with natural rubber latex and polyisoprene condoms.